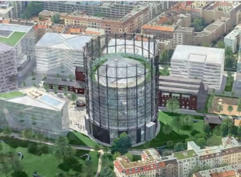 The EUREF Campus is a unique testing platform for the development of the energy efficient model town of tomorrow. Master students are directly involved in the development, testing and realisation of innovative concepts within this laboratory. Presently the EUREF Campus sees the development of the first ensemble of CO2-neutral office and domestic buildings in Berlin. A contribution to this is the biogas powered CHP-plant, which is planned to be complemented by heat provision via geothermal sources medium term. A local grid with energy load management is available as a model project for research. The existing brick buildings are renovated respecting listed building regulation and energy efficiency. All new buildings are certified LEED gold and "green buildings". TU Campus EUREF is a member of the "Internationales Schaufenster Elektromobilität Berlin Brandenburg". The platform elektroMobilität of the InnoZ on the EUREF Campus develops and tests car sharing of electric cars, a micro smart grid with regenerative energy production and intelligent charging processes as well as innovative applications on information processing and booking of multi-modal transportation services. The micro smart grid is the intelligent electric grid on the defined space of the EUREF Campus. It links different sources of energy, end users, and stationary and mobile storage capacities. A core component is the integration of electric cars as a buffer for the storage of volatile energy production from renewable sources. TU Campus EUREF is part of an innovative community active in the fields of applied science, business and policy advice which regard sustainability as a core component of their philosophy. The study programs thus happen in a practice oriented environment in close cooperation wih the enterprises located on the EUREF Campus.